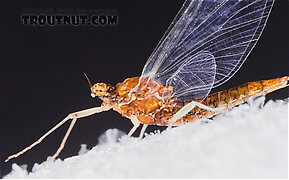 Female Ephemerellidae (Hendricksons, Sulphurs, PMDs, BWOs) Mayfly Spinner View 7 PicturesThis Ephemerellidae spinner was emerging unusually late, and on a warm stream. Since it's a female, identification is difficult. Her identical coloration suggests she's probably of the same species as this specimen collected on a cool trout stream almost a month earlier.